We’ve all been there. One day your pool is a bright, crystal clear, sparkling oasis; the next it’s suddenly turned hazy, cloudy, or even milky, and looks about as inviting as a sheep dip. What caused it, and how do you fix it? What Makes Pool Water Turn Cloudy? Human Sources – sun screen oils/lotions, skin proteins, body oils, perspiration, bodily fluids. Environmental Sources – algae, pollen, leaf mold, dust, fine sand. Chemical Sources – calcium carbonate, calcium hypochlorite. There are two important things to know about the particles – important because they’ll help make sense of how to treat and get rid of them. They are extremely small, anything from 0.5 to 5.0 microns (by way of perspective, an average grain of sand is around 1,000 microns). Since most pool filter systems cannot deal with anything much above 30 microns, they are therefore too tiny to be easily caught by the pool’s filtration. They carry a negative electrical charge. That means they repel each other, and each particle hangs in isolated suspension in the pool water. Why does knowing this matter? Because some of the treatment methods involve actually changing the particles’ electrical charge so that they stick together into large enough coagulated particles that your pool filtration system can deal with them. There are varying degrees of cloudiness. And the degree of cloudiness often is a clue to the cause, and determines the appropriate treatment. Dull or Flat – the pool water seems to have lost its sparkle; a bit like the difference between gloss and matte paint. Hazy – more than just appearing dull or flat, the water actually isn’t clear anymore; you can see the bottom of the pool, but not distinctly. Cloudy – the water has a definite milky quality; at the shallow end you can see the bottom of the pool, but at the deep end you have to stare pretty hard. Opaque – very milky pool water; you can’t see the bottom at all. Just as there are any number of sources, there are any number of reasons why these particles suddenly appear. And, very often, there’s not so much a single reason as a number of different reasons which combine together and feed off one another, with the end result that your pool water turns cloudy. Very often, the reason that your pool is cloudy is simply because it is receiving insufficient filtration. Insufficient Filtration Time. Pools need 8 hours of filtration a day, and if you’re pump isn’t running long enough it’s not going to be able to filter the water properly. Inadequate Filtration Equipment. If the filter size is too small, or the pump itself is too small for the size of your pool, the result can often be cloudy pool water. Inappropriate Filtration Equipment. Equally, if your pool pump has too large a horsepower motor for your pool size, the water will be driven too fast through the filter and you’ll actually get reduced filtration. Dirty or Damaged Filtration Equipment. If you have a sand filter, make sure it’s clean, the filter basket clear, and that you backwash until the water runs clear. Also, if you have a multi-speed pump, make sure you’re not backwashing on low. If you have a pool cartridge filter, check that it doesn’t need either cleaning or replacing. Inadequate Circulation. This could be the result of valves being closed when they should be open, or open when they should be closed. Equally, skimmer baskets may be blocked by leaves, plastic toys, etc. You’ve probably noticed after a day of heavy pool use, especially after a pool party, the water is looking a dull or hazy. The reason is the pool’s chlorine has been fighting to cope with all that sun screen/suntan lotion, body oils, hair oils, and bodily fluids – including, especially, pee! What happens is that the chlorine reacts with all of these (and especially with the ammonia that rapidly breaks down from urine), the insoluble waste products of which process are called chloramines. Chloramines don’t just make the water slightly cloudy, they give it that unpleasant and all-too characteristic chlorine smell. If it’s in the air, or on the ground anywhere near the pool, whether it comes from Mother Nature or from a nearby construction site, the chances are it’s going to get into the water. Pollen, Dust, Leaf Mold, etc. 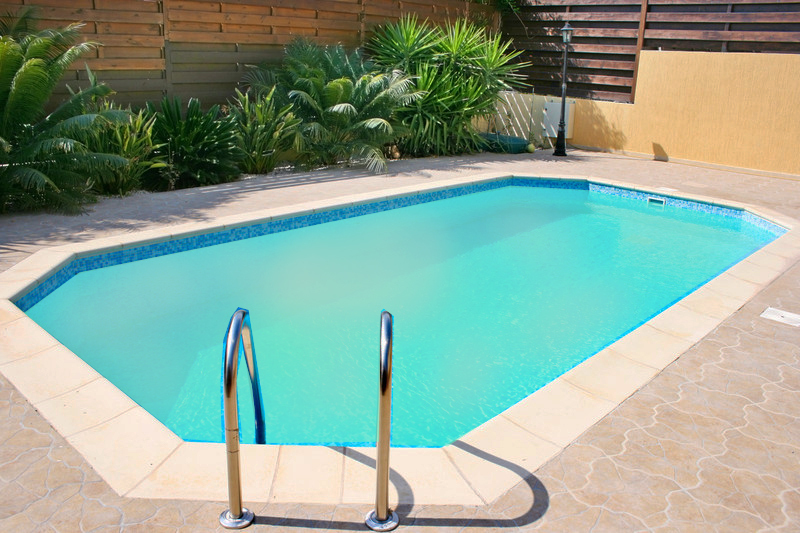 The particles may be too fine for your pool system to be able to filter them out. Water Run-Off. The problem is the phosphates, nitrates, and other chemicals that get washed from the backyard into the pool during a particularly heavy downpour that can cause the pool to become hazy or cloudy. Insects, Animals, Bird Droppings. Dead things in the pool, or bird droppings in the water have the same, indeed more, effect on producing chloramines as human waste products. Algae. A cloudy pool may herald the onset of an algae bloom – especially if the water also has a greenish tinge to it. The water might start out looking hazy, but the green color will develop quickly. For a thorough discussion about algae, check out our article Green Pool – Guide to Preventing & Removing Pool Algae. Also, if you’ve recently treated your pool for an algae infection, the water will be cloudy. That’s because what you’re now seeing is dead, white algae. To be sure, dead algae are a lot better than live algae, but your pool cloudy until you vacuum it away. The chemistry of your pool water, including is chlorination, pH and alkalinity levels are all common causes of pool cloudiness. High pH. When the pH level of the pool becomes too high (over 7.8), the water is no longer able to hold calcium carbonate in solution. Instead of being held in solution, it becomes held in suspension. Result? A cloudy pool. Additionally, at high pH levels, chlorine loses much of its potency to destroy bacteria or algae. The net effect can result in early algae growth – thereby further adding to the cloudiness. Calcium Hypochlorite. Cloudy pool water can be the result of overuse of granular Calcium Hypochlorite shock treatment. High Total Alkalinity. If the Total Alkalinity of the pool is too high (over 170 ppm), cloudy water can easily result. Water Temperature and Calcium Hardness (CH). Water sourced from limestone-rich areas is often high in calcium. Calcium dissolves more easily in cold than warm water, and when the water temperature exceeds much above 29ᵒ C it falls out of solution into suspension. The good news is that, in most cases, the fix for how to clear a cloudy pool is fairly simple. All that’s normally required is the administration of the correct dose of a water clarifier and/or flocculants. Remember the two important things about the particles? They’re small, and they repel each other because they’re all negatively charged. The way that clarifiers and flocculants work is that they neutralise the electric charge so that the particles bond together into something either big enough to be filtered, or else heavy enough to sink to the bottom of the pool for later vacuuming. The important thing, however, is DON’T USE TOO MUCH. Using too much won’t just neutralise the electrical charge, it will reverse it. The result will make the pool even cloudier. Add the recommended dose of clarifier for your pool size. Keep the pump and filter system running for 12 hours. Keep the pump and filter system running for 8 hours. Turn off the pump and allow the pool to rest for 8-10 hours. Vacuum the pool thoroughly, and run to waste. Run the pump for another 4 hours. If you’re certain it’s algae, apply and algae treatment and then perform the appropriate steps above. If you’re not sure, you’ll know it’s algae if you perform the steps above and the cloudiness returns, and probably gets worse, within a day or so. In which case, apply an anti-algae treatment. Add water to the pool above the skimmer box line. Adjust the pH to 7.8. If you have a sand filter, set it to recirculate. If you have a pool cartridge filter, remove the cartridge. Add the recommended dose of flocculant for your pool size. Keep the pump running for 2-3 hours. Turn off the pump and allow the pool to rest for 10-12 hours. Vacuum the pool thoroughly and run to waste. If the water is still cloudy, let the pool rest for another 24 hours and repeat vacuuming and running to waste. Always bear in mind that cloudy pool water can be caused by multiple factors. So make sure that one of these isn’t mechanical, and make sure your filtration system is clean and operating efficiently. And make sure that your pool has consistent and sufficient chlorination. The lack of chlorine is always the first and biggest problem. What does that mean: Run to waste???? Thanks for the question. “Vacuum to Waste” means you will select the “waste” option on your pump valve. You don’t want the vacuumed water to end up back in the pool which is what will happen if you select recirculate or filter. Hope that helps. i don’t have a vacuum but I have white and yellow particles floating in my pool and its cloudy, I have used flocculent but n0thing has changed?? My pool was very cloudy and I’ve used a floc. That made it all settle on the bottom but…when I vacuum it, the jets bring the water back into the pool very cloudy and I have to start all over again. My filter is an Aquatight (e150 I think) with a cartridge filter. After each vacuum, I remove the cartridge filter and thoroughly clean it but…it makes no difference, the pool is immediately cloudy again once I start vacuuming. Any advice or suggestions would be very much appreciated. Hey Vic, Your filter/vac is like mine – designed to circulate water back into the pool just like your filter-pump, with the added benefit of being able to focus where it pulls the debri from. Mine also has an added filter cup which I find is useless for floc clean up. The trouble with this vac type is that it grabs all of that nicely clustered gunk and spits it back into to pool – ruining all the good work the floc has done. It does tend to settle again, although not as nicely as the initial floc results. My solution for this is to identify the pump outlet location (which will be cloudy jet back into your pool when you are vacuuming up the floc) and putting in a small pipe/hose to redirect it out of the pool – in my case the vac came with a skimmer attachment with a short tube that fitted perfectly. This will mean the water/floc you vacuum up will flow out of the pool, and you will need to replace that water after you have finished. Thanks for all your information. I have had a terrible time with my pool!!! First, it was brown….fixed that and it turned green…..fixed that. Now I have opaque water. Took a sample to pool store and they said everything was good except calcium a little low and chlorine a lot low. So, I upped the chlorine. Waited several days with no luck. So, I super chlorinated the pool. 6 days later, only a slight improvement. Now, I have flocced it. I vacuumed to waste and am still opaque. No different than I was a few days ago. I believe that eliminates everything except the pool filter (sand). Should I try DE first before I change out my sand? The sand is only about 3 or 4 years old. I’m at my wits’ end. I have since changed out my sand. It is 24 hours later and I have minimal improvement. So confused and frustrated. I had a high PH and used granular chlorine and got a white milky pool. Added acid to fix it. I did not know that the way flocculants work is that they neutralize the electric charge so that the particles bond together into something either big enough to be filtered, or heavy enough to sink to the bottom of the pool. Using them in your pool seems like an excellent way to clear it. I would imagine that regularly scheduling a day to clear your pool with flocculant treatment would probably help you keep it clear. I’ve done all the advice given & still have hazy water. It looks clean & has no smell, but doesn’t sparkle. What to do now? The free cholorine is higher than the combined cholorine. Everything is balanced except the high free chlorine. And the water looks clean but doesn’t sparkle. Any suggestions?